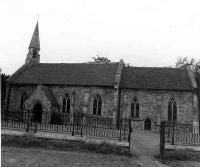 The Parish Church of St Theobald and St Chad which was constructed during the Medieval period. It lies 150m north west of Caldecote Hall. 1 Chancel, organ-chambers, nave with W turret, S porch and N vestry. Chancel and nave are late 13th century. The remainder dates from the restoration of 1873. 2 There was a priest at Caldecote in 1086. 3 There are only three dedications to St Theobald in England.